The networks typically love to air their best shows Sunday night. At that time of the weekend, they know you’re invariably flaked-out on the couch watching the telly meaning big audience ratings numbers for them and their advertisers. Knowing that, Roy Morgan Research commissioned a study to find out how much Sunday night audiences spend on groceries during the week. According to its research Aussies fork out a whopping $2 billion a week on their grocery shops which highlights the importance of ad spends particularly during these Sunday night programs. Viewers of the average Sunday night episode of Seven’s My Kitchen Rules together spend an average $236 million a week on groceries – which is around three times more than viewers of either Nine’s Australia’s Got Talent ($81 million) or Ten’s I’m a Celebrity, Get Me Out of Here ($71 million), which also aired on Sunday nights in early 2016. 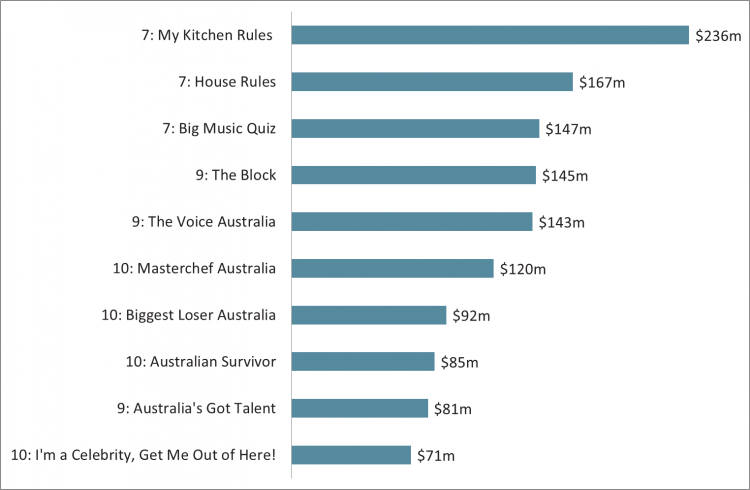 Seven’s mid-year season of House Rules reached $167 million worth of the week’s grocery expenditure on an average Sunday night, ahead of competitors The Voice ($143 million) and MasterChef ($120 million). Last year’s closest Sunday night race for grocery dollars was from late August between Seven’s new Big Music Quiz and Nine’s twelfth season of The Block. Seven’s music show reached $147 million in weekly grocery spend per average episode – just nudging out the $145 million spent by Block viewers. The Biggest Loser didn’t screen in 2016, but is scheduled to return to Ten in 2017. Its late-2015 Sunday night episodes reached $92 million in weekly grocery spend. Australian Survivor reaches $85 million of grocery spend – more than the more widely watched Australia’s Got Talent ($81 million), thanks to its greater popularity among higher spending grocery buyers. Reconfiguring viewership as an audience dollar value in the grocery market delivers the strongest boost to MasterChef. Its typical pool of Sunday night viewers is not only popular among grocery buyers, but they spend $18 more a week than the average Australian. MasterChef’s $120 million worth of ‘grocery market reach’ is 14 per cent bigger than its share of the population. Other shows that are notably more valuable to grocery advertisers than their raw viewership results alone would suggest include I’m a Celebrity, Get Me Out Of Here!, The Voice, The Biggest Loser Australia, and even My Kitchen Rules. Commenting on the study, Roy Morgan CEO Michele Levine said: “Woolworths is the more common supermarket of choice nationally, and also among grocery buyers who watch My Kitchen Rules, House Rules, Big Music Quiz, The Voice, Australia’s Got Talent and I’m a Celebrity. “However Coles has the lead among viewers of The Biggest Loser, Australian Survivor and MasterChef – all Network Ten shows, and all shows that are particularly popular among grocery buyers with bigger weekly supermarket budgets,” she said.